← Android, how to get PDF thumbnail images in application? Question:I want to convert the PDF to image through PHP by API but when the output image generated it's get blur from original.I use some application in the market. Blur image is not what I want, so I guess is there any solution on VeryPDF? Answer: When you need to convert PDF to image through PHP by API, maybe you can have a free trial of VeryPDF cloud based application named PDF to Image Converter Cloud API, by which we can convert PDF to image like JPG, PNG, normal TIFF, Faxable TIFF, GIF, TGA, PCX, BMP, etc. images. And VeryPDF cloud based application can be called from any platform and any program languages, include C#, VB.NET, ASP.NET, ASP, PHP, Java, Ruby, Amazon, etc. And the output will not be blur. Please check more information of this software on homepage, in the following part, I will show you how to use this software. 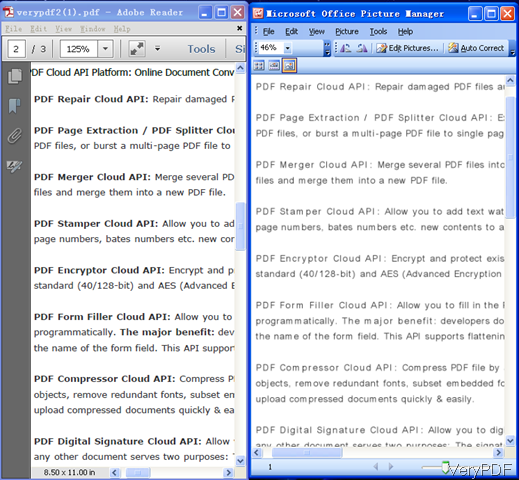 By the above URL, we can convert PDF file to black and white TIFF file and set resolution as 300 DPI without dithering. Meanwhile by this application, we can specify conversion page range like, if you need to only convert the first page of PDF, please add parameter &-f=1&-l=1 like this. Please check more parameters on the user manual. There are too many, I can not list all of them here. By this API, we can convert PDF to image from PHP code easily. Now let us check the conversion effect from the following snapshot. During the using, if you have any question, please contact us as soon as possible. This entry was posted in VeryPDF Cloud API and tagged PDF to image. Bookmark the permalink.